AUGUSTA, Maine — Gov. 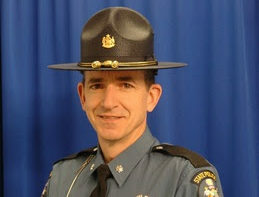 Paul LePage on Friday nominated Lt. Col. John Cote to be the next chief of the Maine State Police. Cote is the former commanding officer of Troop F in Houlton and a 29-year veteran of the state police, who was promoted to deputy chief two years ago. He has been serving as chief of the state police force since Col. Robert Williams left the position in March to become head of security at Colby College in Waterville. A former deputy with the Aroostook County Sheriff’s Office, Cote joined the state police in 1989 and spent much of his career with the criminal division, investigating homicides and suspicious deaths. He holds an associate degree in criminal justice and legal technology from the University of Maine and has completed numerous law enforcement professional development courses, including a 10-week program at the FBI National Academy in Quantico, Virginia, in 2017. A native of Aroostook County, Cote has lived in Mars Hill for most of his state police career. Upon becoming deputy chief, he moved to the town of China. The Maine Senate must now confirm the nominee after a public hearing that will be scheduled before the Legislature’s committee on criminal justice and public safety.